and my uncles have wrinkles. with scars on their chins. and so do their twins. they look perfect to me." I am a fan of nonsense verse and wordplay. Calef Brown is adept at both. I have read these poems a few times in preparation for writing this post today, and found myself laughing out loud at some of them. I definitely have favorites. 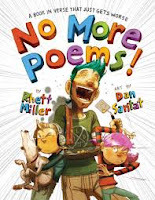 I know that kids who have the same propensity for fun poetry will find much to please them here. the finest in the South. (but stick to the roof of your mouth)." He begins with an intro, ends with an outro ... and in between, Mr. Brown divides his work into five categories ... People are People, Foodstuffs, Sleepy Time, Oddments, and Animal Life. this, my thirteenth book so far. I did my best to raise the bar. from purely fun to very strange." as a diamond aglow in the dark. The wind sounds as sweet as a lark. "Try any, or all. Answer the call! And now for a few more (un-asked-for) suggestions. Predator and prey both fight for survival. It is the way of the natural world. Predators must have food to live; prey want to avoid capture at all cost. 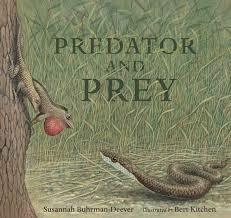 The predator and prey presented as partners in this amazing book of poetry use their voices to defend themselves. "One species of assassin bug from Australia hunts spiders. Spiders "listen" to the movements of their webs to learn when prey has been caught. The assassin bug takes advantage of this. The bug plucks the silken threads of the spider's web with its front legs to mimic the movements a trapped insect would make. The spider goes in for the kill, but the assassin bug is the one to get the meal." Bats and frogs are next, pictured on a double page spread showing the bats scooping frogs from the water. Gatefolds open on both sides to reveal another poem for two voices, and an information box with three short paragraphs that describe the combative pair. Such encounters fill the pages, with Mr. Kitchen providing stunning art for each. dramatic. Each of the paired prey-predator creatures give readers a sense of the unique skills they bring to the match. "Hey, you! Get off my lawn!!" 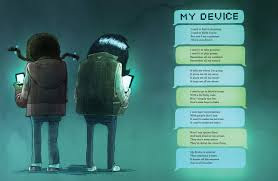 What wonderful teamwork for a book that combines, poetry, science and brilliant design! "Not YET - but it WILL be,"
said Fox. 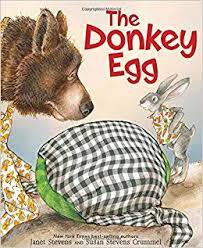 "It's a donkey egg! Little kids are not likely to fall for Fox's scam about a donkey hatching from an egg (when it is perfectly obvious they are looking at a watermelon), but Bear falls for it! We know Fox to be a wily character. So, when he drops by with a proposition for Bear, it isn't surprising that he convinces Bear to part with $20 in exchange for a 'donkey egg'. Bear is a tad cynical; Fox is very persuasive. And DONKEYS! It's the truth!" A donkey will be a great help to Bear in his quest to establish a fine farm, but ... Fox will not be thwarted, and Bear becomes the proud parent of a donkey egg. Hare comes by and tries to persuade Bear that sitting on the egg will not help it hatch. Unconvinced, Bear keeps sitting and Hare returns to racing. Bear spends a great deal of time (all dealt with in sidebars describing its passage) warming, rocking, telling stories, and playing with the egg. It takes a spider about an hour to spin a fancy web. You blink your eye over 1,000 times in an hour! Your heart beats over 5,000 times in an hour!" Bear proves to be a fine parent. Despite all the attention given, there is no donkey. Full of purpose and positive thoughts, Bear refuses to give up on his egg. When fatigue overwhelms, a terrible accident reveals the truth. Disheartened, but pragmatic, Bear sees promise in the seeds he finds in the demise of his egg. Bear and Hare work together to till, weed, plant and water. In the end, the sale of the watermelons grown result in a big surprise for Fox. 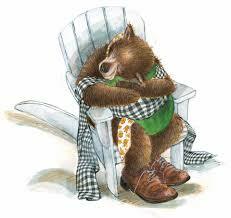 The farm setting, and these lovable, familiar characters (Tops and Bottoms, 1995) have me hoping that sisters Janet Stevens and Susan Stevens Crummel might return with another story about Bear and Hare, sooner than later. It is lovely to meet up with them again in this endearing and humorous tale of friendship, tomfoolery, and poetic justice. The short rhymes and the overall rhythm of the telling have me including it for today's post. The joyful mixed media artwork is sure to capture kids' attention as it is read. From the cantankerous, lazy Bear and the energetic, helpful Hare to the sly fox and the mysterious 'egg', they will be captivated. Man, I feel sorry for you "
Some people are going to love this book; others will not. With its irreverent humor and broken rules concerning grammar and punctuation, it will find favor with middle graders who love to scheme, and who see many adults as not quite as flawless as they would like kids to think. They will surely capture attention. Rhett Miller starts with a boy who uses a type of 'secret karate' to deal with flushing the toilet. In the top secret art of Kung Poo"
He goes on to consider an alarming case of purple pox, brotherly love, the lure of the 'device', nose hairs, weirdos, twins, bathtub space, a plea for a dog, homework, baseball, stinky mouths, wrestling, a disco bath party, nighttime blues ... and so on. All subjects you might think of interest to a middle grade audience. Dan Santat ups the appeal at every turn, with brilliantly expressive mixed media art. He creates unforgettable characters who bring each and every poem to life. From the girl trying to convince her parents that she needs a dog by using a projector and a 55 page presentation, to the terrifying visage of an over-zealous baseball coach whose kid finally puts him in his place, to the mysterious 'bubbles' in a bathtub full of boys, Mr. Santat uses every inch of space to entertain and delight readers. “This is for the unflappable. 'til the break of dawn. This is for the unafraid." What a collaboration! It should come as no surprise. 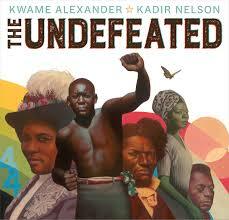 Kwame Alexander has penned a poem that walks his readers through the history of the African-American experience. It is an astonishing and heartbreaking tribute to those artists, athletes, leaders who have accomplished so much; it also assures that the pain and suffering endured will not be forgotten. "This is for the unforgettable. 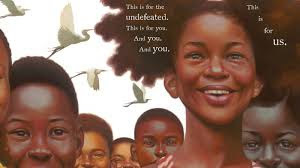 Kadir Nelson's incomparable portraits leave the reader feeling as if they have just walked the halls of an art gallery. They reflect members of a larger community whose triumphs are too often accompanied by tragedy. It doesn't stop them; in Mr. Nelson's beautiful art we are able to see the determination, the pride, the joy felt. Finally, a annotated list of notes on the figures portrayed is included. not a clamor, nor a din ... "
Lavinia is a vegetable-loving badger, not impressed when she wakes one morning to mayhem in her garden. The spuds and beans are gone. She knows just what she needs to do: set a trap to catch the thief! It works. Out she goes to confront the intruder, and finds a frightened white bunny. Rabbit stew is on her mind when the tiny bunny pleads for leniency, with a promise to reward her for his release. "I'm not your basic bunny. I've got magic up my sleeve. if you'll just let me leave." Has Lavinia been duped? Will the bunny return as promised? Lavinia cannot be sure; and she cannot sleep. So, she climbs into a nearby tree and waits. What a surprise when he returns with a bona fide bunny band! The talent is exceptional, the instruments many, and the music magical indeed. They leave at dawn and return at dusk, keeping the little one's promise. her garden grew and grew. her onions huge, like moose. were the size of a caboose." 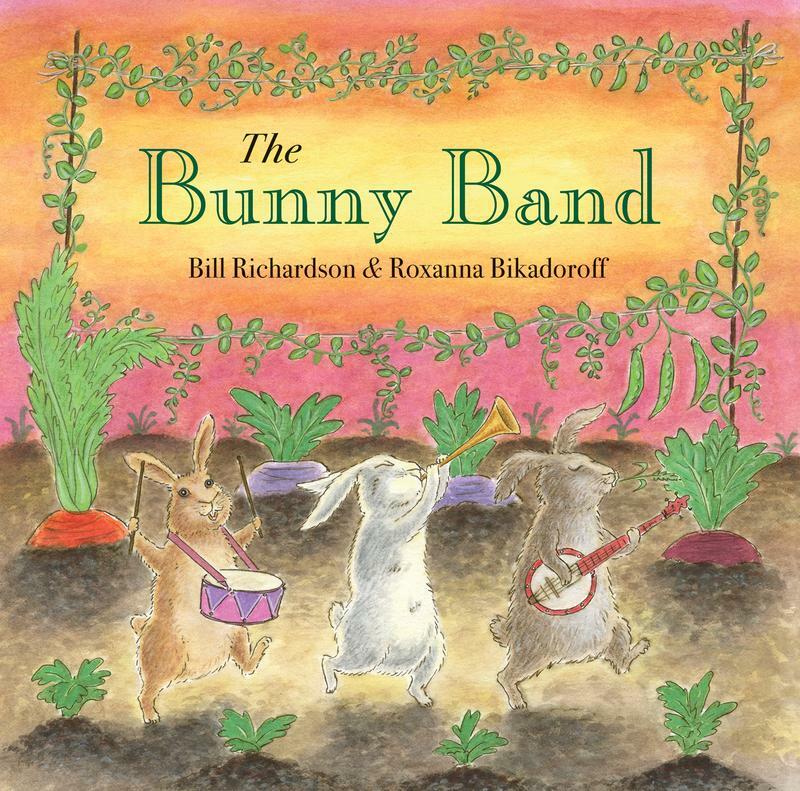 It's a bounteous season for Lavinia, with a grand reward for the bunny band who promise to return in the spring. 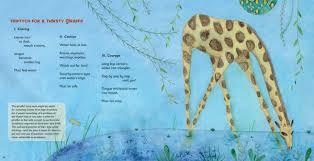 Kids will enjoy the lilting rhymes of this happy story; it is well told. 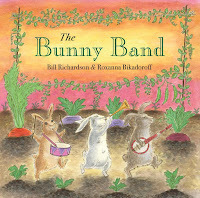 They will be particularly interested in detailed illustrations that bring life to Lavinia's home and garden, and the bunny band itself. Awash with light and shadow, the images created fill every delightful double page spread. Lots of practice is needed before reading this sound-filled book of poetry aloud. 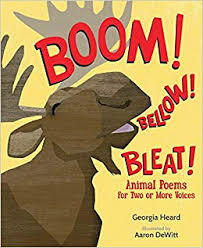 I can only imagine the fun when sharing it in classrooms, and having students fill the room with the sounds of the mammals, reptiles, birds, insects and fish that are featured in the 13 poems included here. Cacaphony in its purest form! A 'performance key' provides guidance for reading. A choice needs to be made prior to performing the pieces. Two voices, two groups ... there are no rules about that. All words in blue are read by all readers. On we go! The style of piece is constantly changing, and sound is the permanent connection. They are written in two colors to give focus for those reading them ... and as mentioned, blue invites participation for all voices. 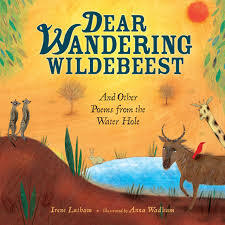 The first poem, Animal Songs, sent me to the Internet to see if I could find examples of each. I did not, for example, know that kangaroos chortled or that scallops coughed. It was fun to check them out, and I'm sure that kids would love to do the same. I think it would make an awesome performance piece. Lots of collaboration for making it work, with a perfect ending for any group of young readers. Listening to the Canada Geese passing over as they return to the north for the summer, We Call to Each Other would be fun. I taught in a grade two classroom for a long time; my students would have loved to share Song Thief. If rattlesnakes hold fascination, some might like to try Rattlesnake Warning. This sound bite is beneficial. I appreciate the many fine details provided in the digital collage images created by Aaron DeWitt. They are sure to invite careful observation as the poems are read together. Occasional notes are provided to suggest directions for furthering the experience. The Nature's Notes in back matter will be useful to parents and caregivers who share this book. I found much of the information to be new to me.